PLEASE NOTE: THE VENUE HAS CHANGED TO MAG ADDICTION GRASSY PARK. 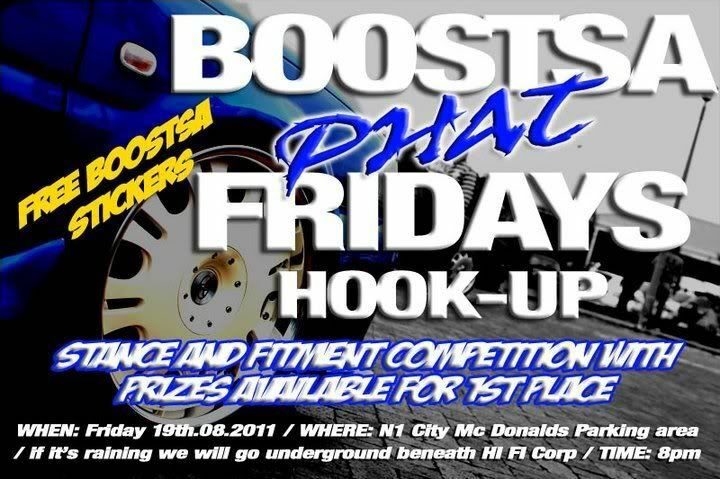 More Info BoostSA “PHAT” Fridays Hook-Up this Friday 8pm. Come roll through and chill with some of Cape Town hottest Rides and people. We will be running a Stance and Fitment competition which will be COMPLETELY FREE!!!!! If your car has and hard stance with a wicked wheel and some poke, tuck or flushness be sure to roll it past the judges and you could win a BoostSA DVD, BoostSA Sticker pack and a free photo shoot . Your judges will be non other than Mr Joe Klein and the King Cobra Himself Mr. Abdul Sayed. The judges will be looking for cleanliness, proper fitment, safety and over-all appea. lBe sure to bring along your polish and buffing rags. BoostSA will be shooting pics and video of the entire event THIS ONE IS GOING TO BE LARGE.